Our mudroom is complete! I could jump for joy (and I have) because we do not need to endure another winter of tripping over wet boots in the hall! We also don't need to store Rudy's stroller in the dining room anymore. Hurray! I'm excited to share some photos of our project but first, I want to remind you of how far we've come and why this project was so necessary. Our house is always a work in progress. 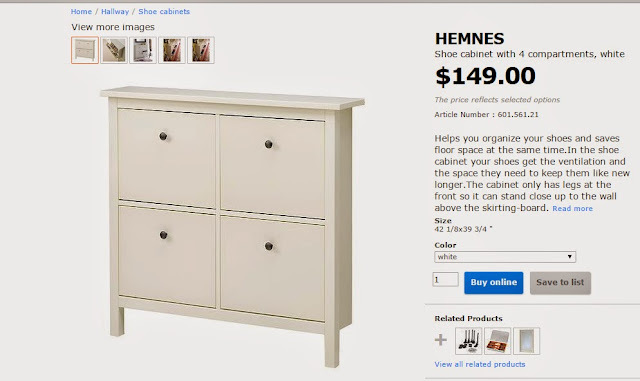 A room is never finished, since it evolves with us. This was exactly the case in our entrance hall. As you may already know, our small house did not offer much in the way of closet space when we moved in. We've had to carefully plan and create our own storage solutions throughout the house. 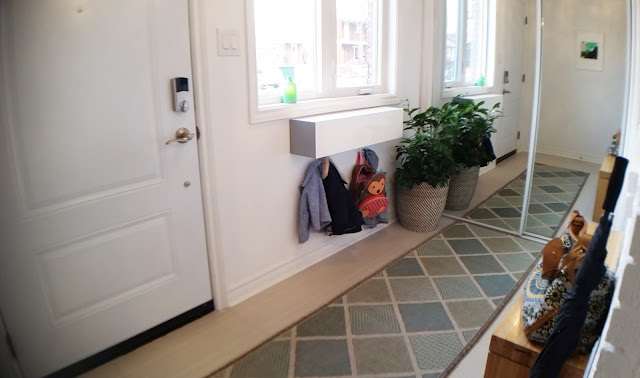 We worked to add hooks to our entrance hall for storage and we decorated a shoe organizer but there wasn't much we could really do to create more space. 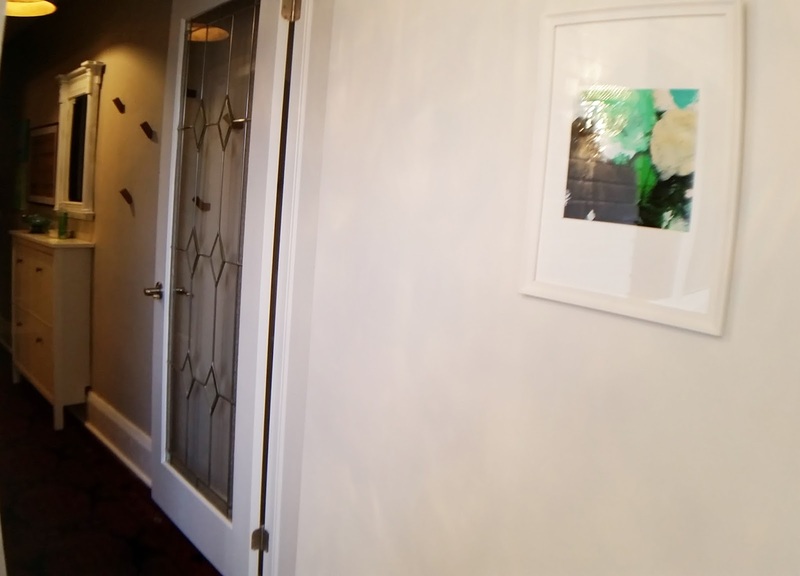 You can read about our initial hallway makeover here. We didn't have room for many coats. 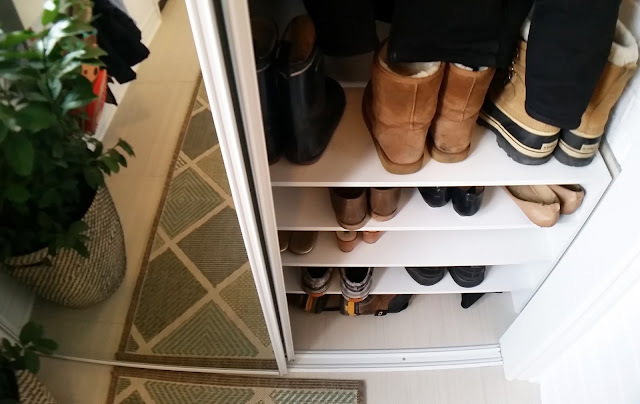 Our shoe organizer was too large for the space. That plant got zero light and took a beating from doggy tails each time one of us came home from work. While not referenced in the photo, the front door was awful. It was hung upside down and it didn't let any light in, creating a dark and claustrophobic space. Earlier this year, we began improving our space by buying a shallow shoe organizer. 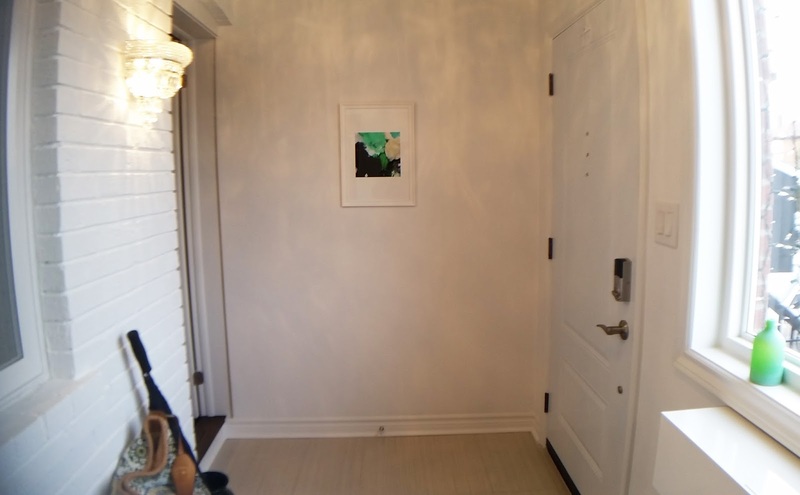 We knew that our mudroom would still not give us unlimited space and now we have a space for dog leashes and coats. I recently shared photos of our new front exterior which you can see below. 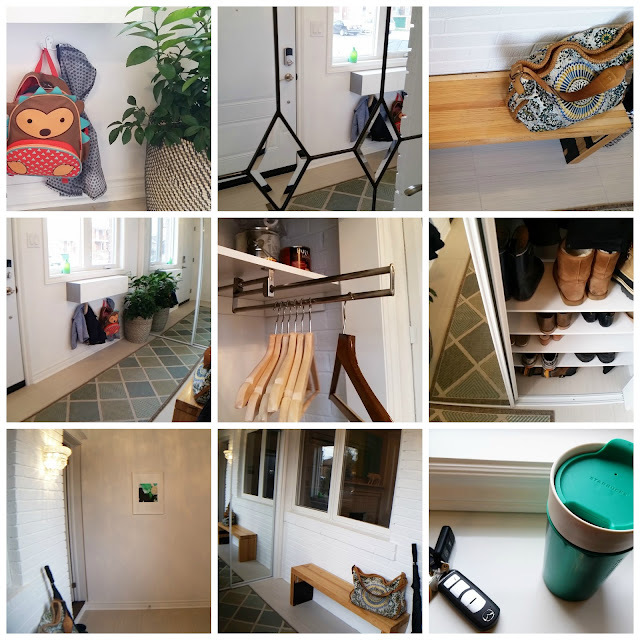 We love the look of our new entrance, however the functional aspects of this reno were far more important to us than the aesthetics. 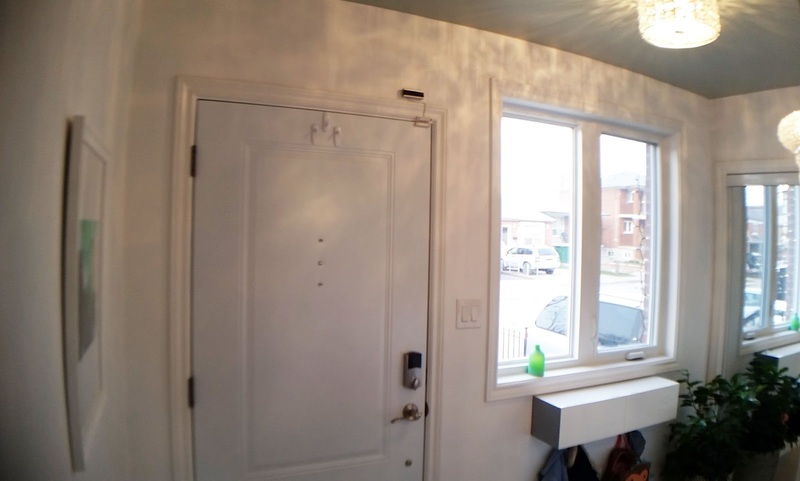 Our contractor followed our plans with respect to exterior finishes, but we had requested that he leave the interior completely blank... including the closet! 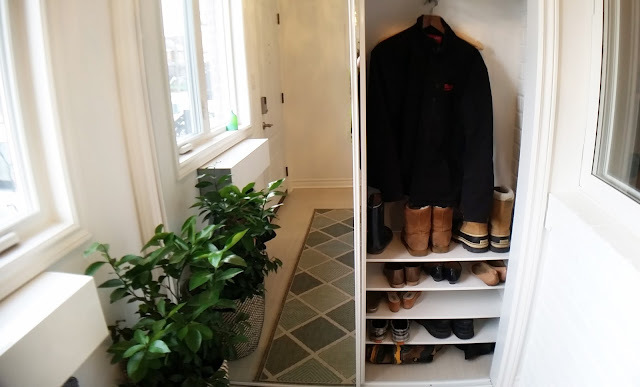 Below, I'm sharing another look at the inside of our mudroom. The left shows the room nearing the end of our renovation and the right shows how it looks today! 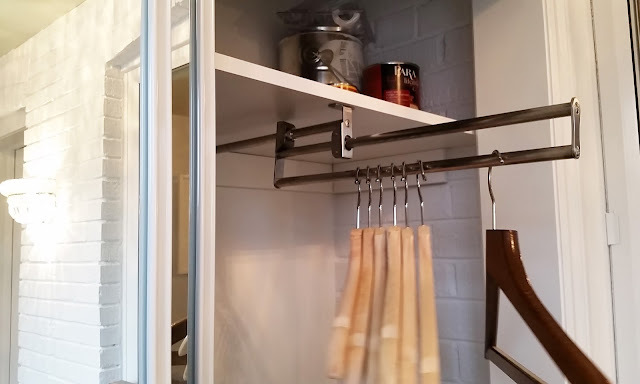 We had our contractor to install mirrored closet doors to make the space feel larger. 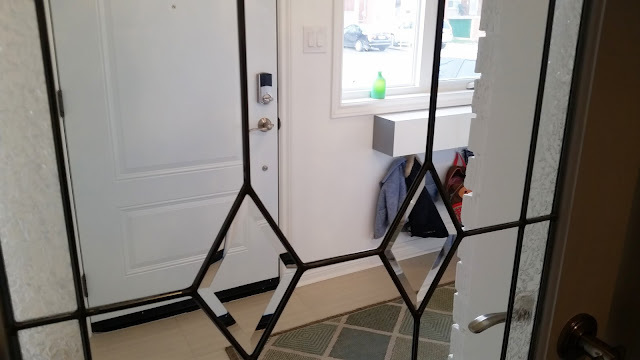 I maximized the effect of the mirror with a long, patterned indoor/outdoor runner. 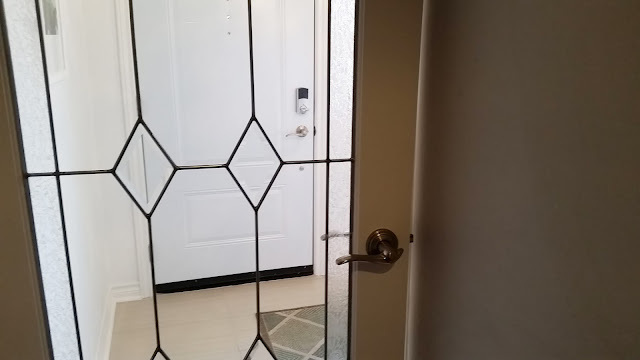 The old exterior door was replaced with a beautiful glass door which lets light from the mudroom into our entrance hall. 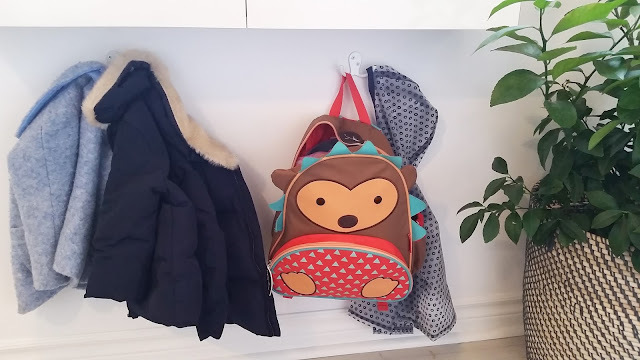 We hung some cubbies with hooks below them so Rudy has a place to hang her own coats and backpack. The cubby shelves also give us a place to rest our coffee and keys while putting on our coats. A little bit of greenery always makes a space feel more homey. I bought a Meyer Lemon plant, which is supposed to be tolerant of cooler rooms. So far, it is still alive. We left the brick wall exposed and just had our contractor paint it white. We did add some glamour to the room by adding pretty light fixtures. 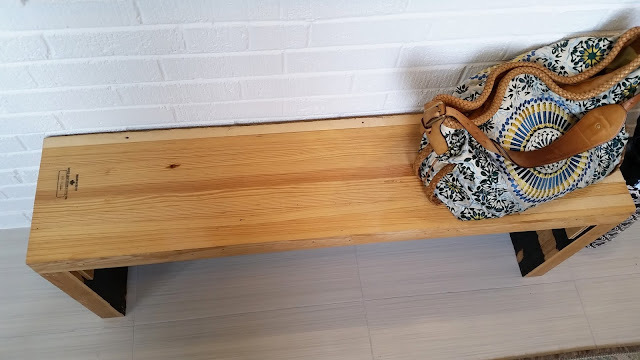 While we may need a storage bench in the future, for now we're living with the bowling lane bench that Corey made when we still lived in the condo. It has so much character and we still love it. For the floor, we chose very neutral tiles with just enough texture so they don't become slippery when wet. We kept the walls in the small space white and instead chose to paint the ceiling a pale blue/green shade. 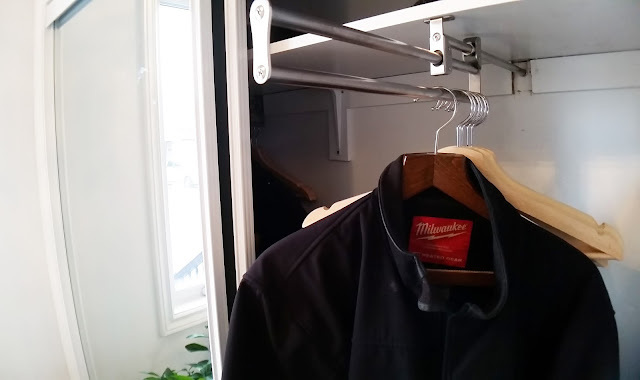 Our closet is too shallow for a traditional bar for hangers. We ended up finding pull-out bars online and Corey installed one on each side. Where there's a will, there's a way! Corey also added shelves to store our boots and shoes. We love that those clothes racks pull right out for easy access!